Indiana State Fair 2018 Photos #1: Our Year in Food « Midlife Crisis Crossover! Also complicating our day: rain throughout the early morning hours. We arrived in the fairgrounds parking lot at 8:15 to ensure we’d have a decent space, then waited in the car another 45 minutes till the exhibit halls opened and provided indoor activities to occupy our free time till all the food vendors opened at 10. A few places offer breakfast before 10, but only one of them was on the “Taste of the Fair” roster — the same place that sold me bitterly burned grilled cheese three years ago. So we fasted till 10. By that time the rains continued but at a weaker pace. Fortunately one upstanding “Taste of the Fair” competitor opened on time and had seating space under tents. 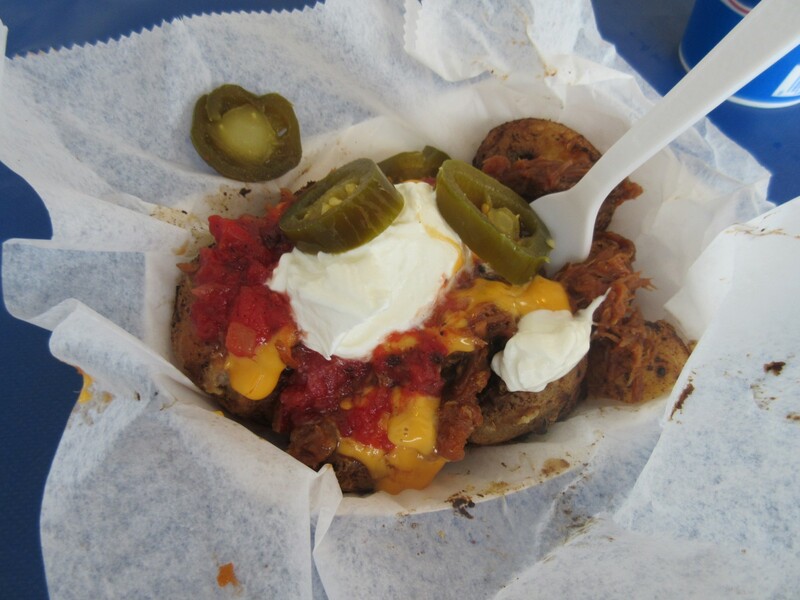 Shout-out to the Indiana Pork Producers Association for raising the bar high with my first dish, BBQ pork “potachoes” — li’l potatoes seasoned and topped with barbecue pulled pork, nacho cheese, salsa, sour cream, and jalapeños. By now I was so hungry, I even ate all the jalapeños. All the other toppings balanced them out just fine. Anne doesn’t require her meals to be weird or groundbreaking, and was fine with indulging in a basic pork sandwich. Much of her day was more traditional fare like that. As long as she gets her hands on at least one lemon shake-up in a given fair day, she’s satisfied with her choices. She was also fine with waiting a few extra minutes for them to finish cooking their first pork sandwiches of the day. Freshness is a food criterion to be treasured when we can find it. Surprisingly, I wasn’t full yet. A few hundred feet west of the Pork Producers, their comparatively upstart rivals at Pork-n-More, who’d won my heart two years earlier with a Fruit Tea Twister. 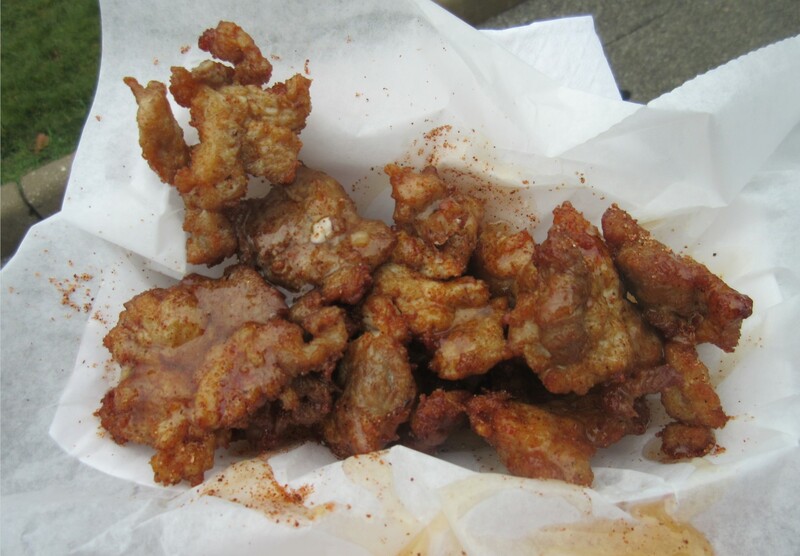 This year’s signature item for them was called Piggy Popcorn — deep-fried pork cutlets in a sweet Hawaiian chili sauce. Smaller and not as spicy as I expected, but I can imagine people craving them. 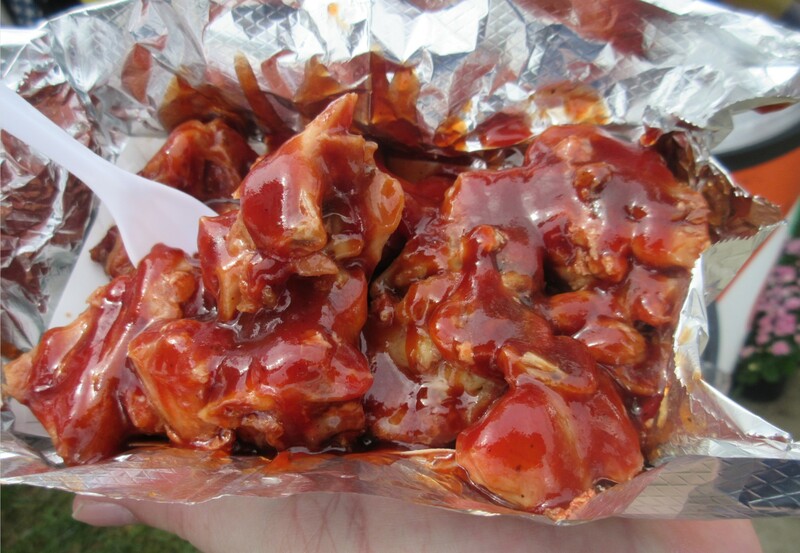 One caveat: some piggies were strung together and required a fork to separate without splashing sauce all over myself. They didn’t give us a fork. We didn’t see forks on their counter. We had to go bum a fork from another booth. Once we finished perusing the usual exhibit halls around the southwest corner and the rains had gone away to come again some other day, we migrated north to the other side of the fairgrounds, where a couple dozen food booths line the main straightaway. ‘Round those parts we located the Gobble Gobble truck that featured the Turkey Tips in our lead photo. The sauce was tangier and more tantalizing than the first two dishes, but I learned the hard way that turkey tips are 80% bone. I gnawed a few choice bits of cooked flesh off the bones, then had to settle for sucking sauce off the rest without inhaling a choking hazard. 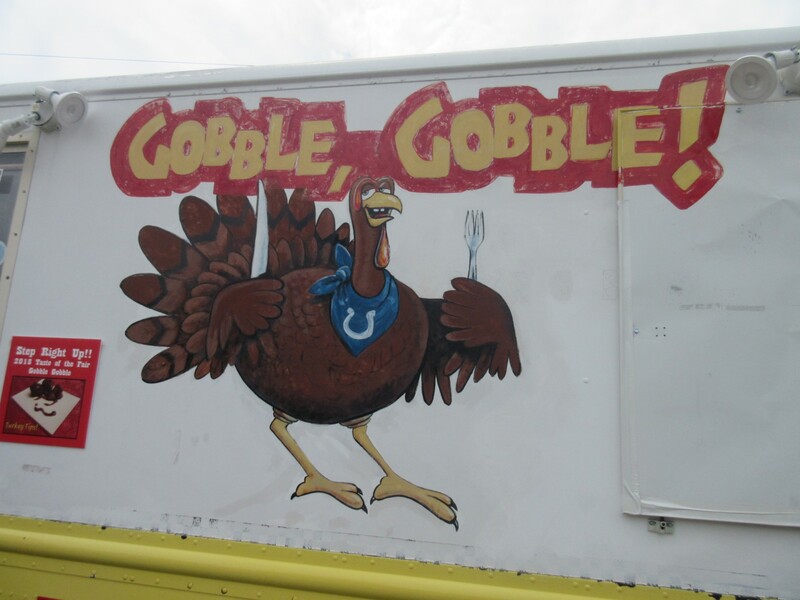 Naturally their turkey is a big Colts fan. 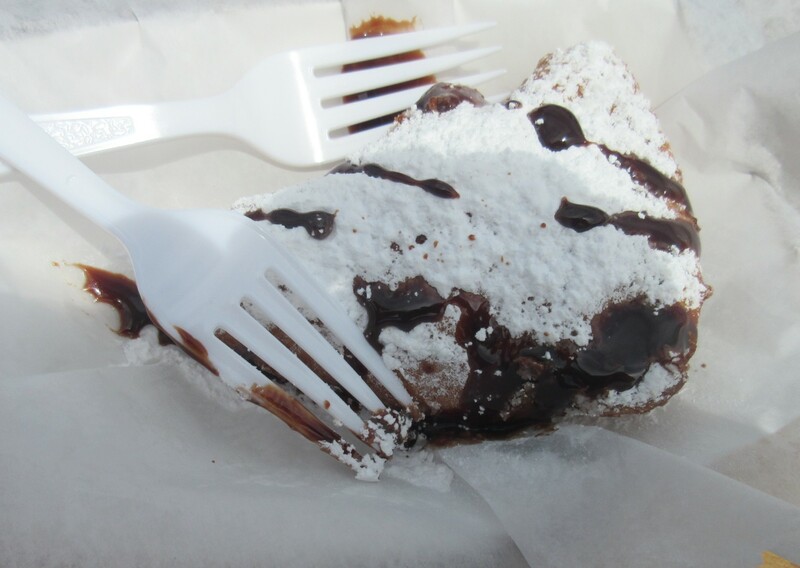 The “Taste of the Fair” features more food than drink. 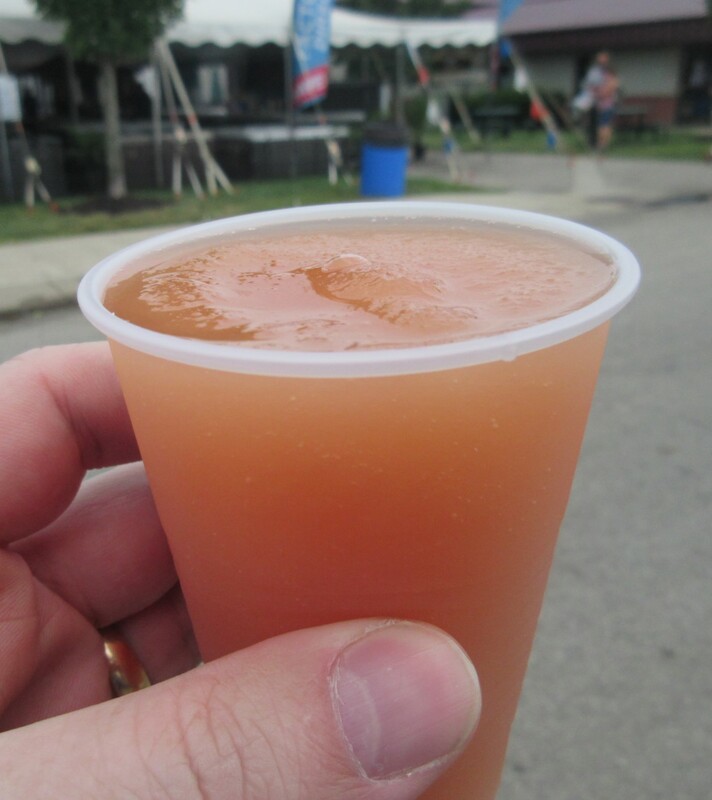 Among those few drinks on this year’s list was the Peach Cider Slushie, which tasted fine and filled a need, but in hindsight I’m annoyed because a few minutes ago I reviewed our records and realized it was a rerun from last year. I’m glad I only paid for a $2 Tuesday sampler portion, because it wasn’t my intent to pay top dollar for a rerun. Another form of sugar was livelier and carried no regrets after the fact: dessert nachos! 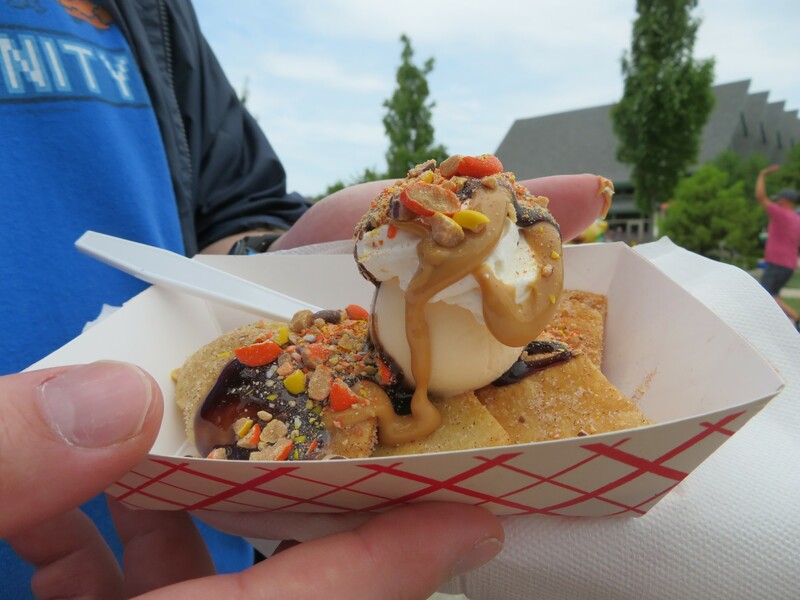 Crispy wedges from the churro/fried-ice-cream family topped with ice cream, chocolate sauce, whipped cream, and Reese’s Pieces. Again I settled for a $2 Tuesday portion, but I would’ve been fine with three times as much if I hadn’t needed to save rooms for other foods. The Reese’s Pieces were optional. They also had strawberries, apples, and…something else? More chocolate, maybe. 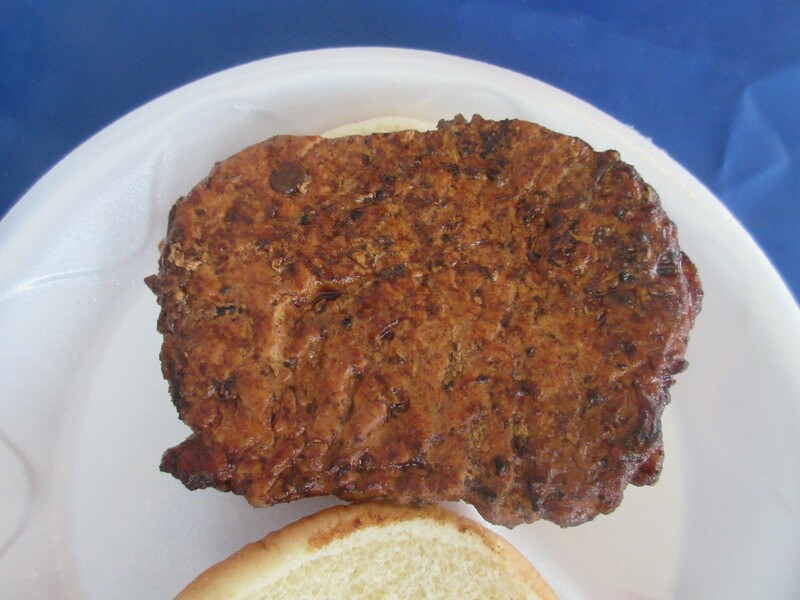 On the northeast corner of the fairgrounds is Red Frazier Bison, a highlight of nearly every year and every “Taste of the Fair” lineup. I say “nearly” because they’ve had a history of selling out of new items before we could reach their distant cranny. Their entire menu of bison-based dishes aims squarely for the discriminating culinary fan, and this year’s addition was no exception: bison rangoon. The filling included cream cheese as well as a sweet corn puree. It wasn’t quite as luxurious as crab rangoon, for which Anne and I will brake hard at any given takeout joint, but it was a savory sensation worth considering in its own right. Anne found hers a bit too oily. They were cooked to order, but maybe could’ve used a few extra seconds’ draining after the fryer. Afternoon wore on and the summer sun had cooked away the rains, returning to its natural state of scalding, dehydrating, and taunting us on our long State Fair walk. In a moment of middle-aged weakness we shelled out a couple of bucks to hop a shuttle back to the south end of the ‘grounds so we’d have strength left to walk the remaining stretch of comestible carriers. 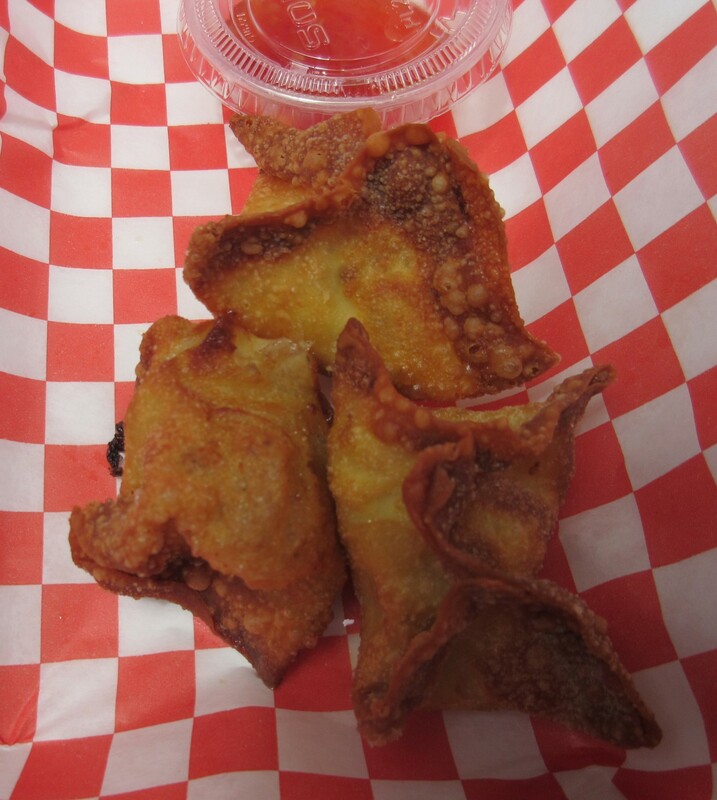 My last big sugar fix of the day fell in the time-honored fair-food category of Deep Fried Snacks. One of the best new entries in years, the Deep-Fried Sugar Cream Pie pretty much tells you everything you need to know up front. Its name is a label for both ingredients and warning. It’s a bit of a sugar bomb, but both the outer batter and the interior pie crust were solid rather than soggy, quite the textural achievement. We ran out of activities and energy by late afternoon, but I fetched one last item to-go, for science. 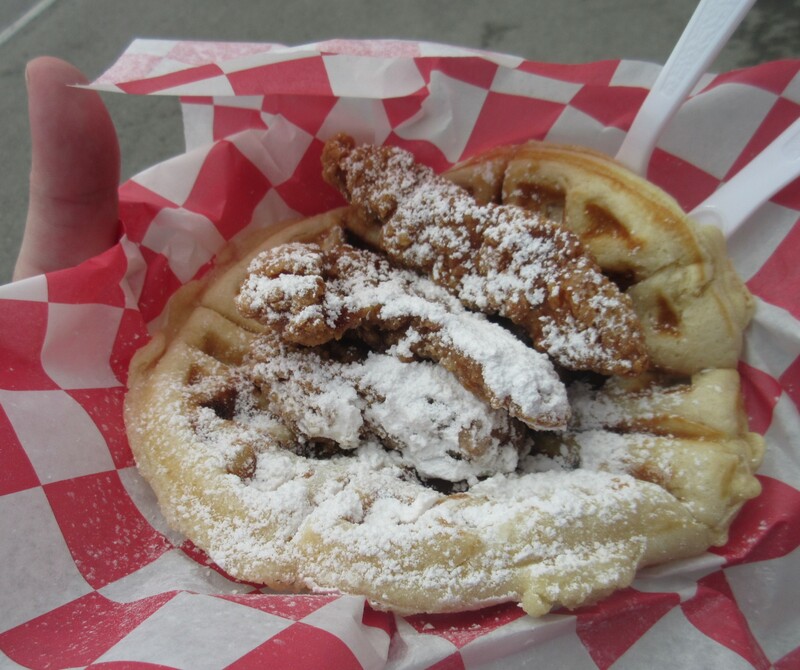 Behold a Deep Fried Chicken and Waffle Sandwich, topped with powdered sugar and pancake syrup. We carefully transported it home and stuck it in the fridge while I napped for the next few hours. Served as leftovers long after the fact, the waffle kept fine but the syrup more or less evaporated or soaked away into oblivion. Microwaving this State Fair chicken rendered it indistinguishable from the Tyson chicken strips in our grocer’s freezer. Lemonade Strawberry Boba Twister — From the makers of the Piggy Popcorn, a shakeup with bubble tea gel-balls. My first experience with boba tea wasn’t rewarding, so I passed. Green Chili Beef Meatballs — Never saw them. Gourmet Tater Tots — Pretty much the “potachoes” but with tater tots instead of small potatoes. The Dilly Dilly — They stuffed a hot dog inside a pickle, then dipped the pickle in corn dog batter and deep-fried it. By the time we spotted their booth at the end of our day, it didn’t sound appealing to me anymore. Bubba’s Bacon Grilled Cheese — a grilled cheese sandwich wrapped edge-to-edge in bacon strips. That sounded like too much bacon for my blood, and the ten-dollar price tag was too rich for it. 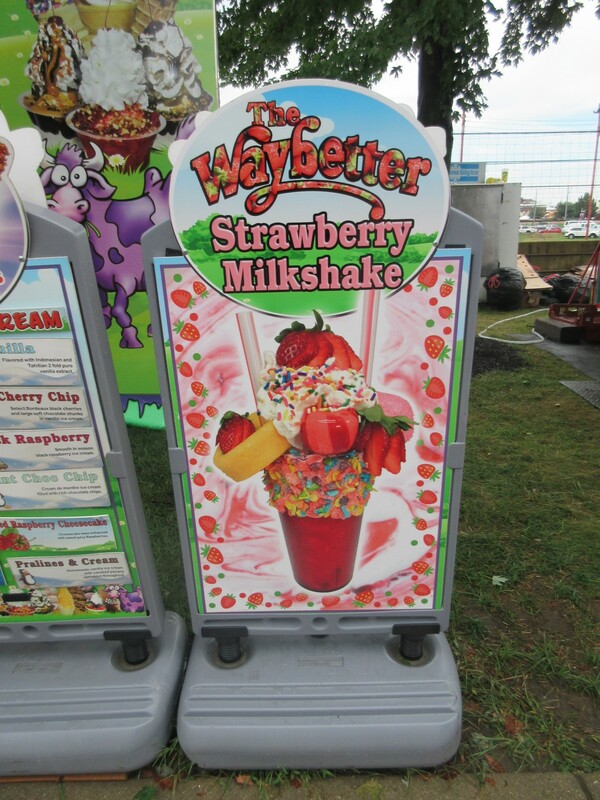 …and the largest and most outrageous of them all, the Waybetter Strawberry Milkshake. There was a particularly nonsensical episode of Worst Cooks in America in which the contestants were tasked with making mixed drinks with large solid objects perched on top for reasons never made clear to me except “this is a hugely popular trend in some city none of us live in.” Here, replace the artisan booze with a strawberry milkshake adorned with Fruity Pebbles, two cupcakes, a sponge cake, a lollipop, and some obligatory strawberries and whipped cream for misplaced sense of normalcy. All on one “drink”. Just add rich creamery butter and call it “the Good Morning Bucket”. We found the Polar Bear Ice Cream stand easily enough, across from the Department of Natural Resources Building. 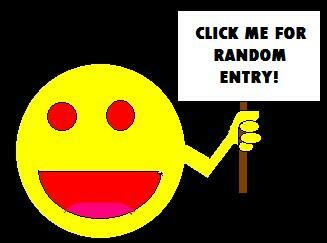 I looked at the picture and knew I couldn’t handle it and shouldn’t try. I would’ve had to skip all other meals for the day and possibly the next three days after. I didn’t bother asking about the price, which wasn’t listed on their menu and couldn’t possibly have been single-digit. Granted, the dishes I ate for the rest of the day totaled to a significant amount in themselves, but I prefer grazing on a relatively diverse foodie-crawl over blowing my entire day on a single fruit-pile juggernaut. Anne gave them money but settled for something a bit more simple — a soft-serve black raspberry ice cream cone. She did not try the super-shake because she is not a family of five. …and that’s Taste of the Fair 2018 from where we stood, fed, and went home bloated and dead on our feet.